A family came to AGi Architects with the challenge of designing a house that would allow them to live outside 365 days a year, even in the midst of the Kuwaiti summer, when temperatures soar to over 40°C. Architects Joaquín Pérez-Goicoechea and Nasser Abulhasan – principals and founders of AGi – decided to use gardens to solve this request, weaving outdoor living into the fabric of the home while creating three spaces for different activities, times of the day and seasons. They examined the behaviour of the family to define the purposes of the outdoor spaces. 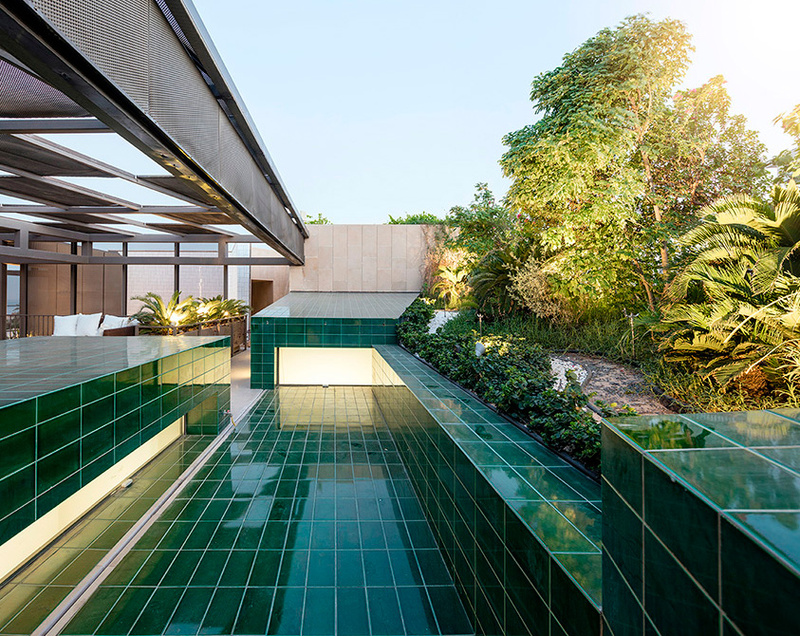 ‘Due to the extreme Kuwaiti climate we decided to stratify the external uses according to the period of the year and the hours of the day in which these activities could be developed, and accordingly we designed three gardens,’ says Pérez-Goicoechea. 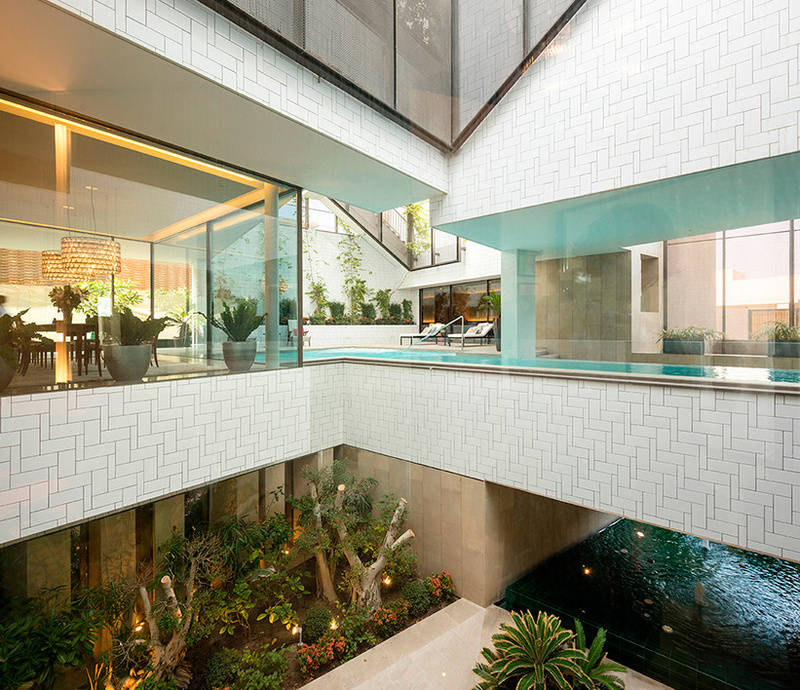 The ‘wet garden’ with pool and fountain exists at the core of the house, to be used during the hot season and connecting all the social living spaces together; while the winter garden, a more relaxed and private space, sits up on the roof where a shaded terrace opens up views to the sea. The summer garden is 4m below street level, where a waterfall has a cooling effect, stimulating evapotranspiration to the upper levels of the house. While there are three gardens, it was also important that they felt like they were all part of the same house. ‘They are three and one at the same time,’ says Abulhasan. ‘The main design challenge we faced was to give to the three gardens their own identity, but at the same time unify them as a single outer space,’ he continues. Once the gardens had been designed, the rest of the house unfolded. ‘The building is meticulously designed to wrap around the three gardens which act like vertical and horizontal voids within the house,’ says Pérez-Goicoechea. Winding exterior stairways are used as a device to smoothly guide inhabitants indoors and out. Like the gardens, the plan of the house has a close connection to the behaviours of the family and their values. ‘We focused on the internal circulation of the dwelling, strongly linked to the concept of “family” assumed by the clients,’ says Abulhasan. The concrete house is wrapped in a perforated anodised aluminium cladding that shades the outdoor spaces from direct sunlight, while retaining privacy for the family. By cascading the gardens and spaces across different levels, the designers used the architecture as a filter system, subtly delineating the private space for the family members and the more communal spaces for guests. ‘The circulation inside the building – both vertical and horizontal – is conceived in a fluid way, creating multiple routes and possibilities for the inhabitants to reach the rooms in a more or less direct way,’ says Pérez-Goicoechea.